Chantilly is a sweet addition to Indiranagar’s 12th Main. 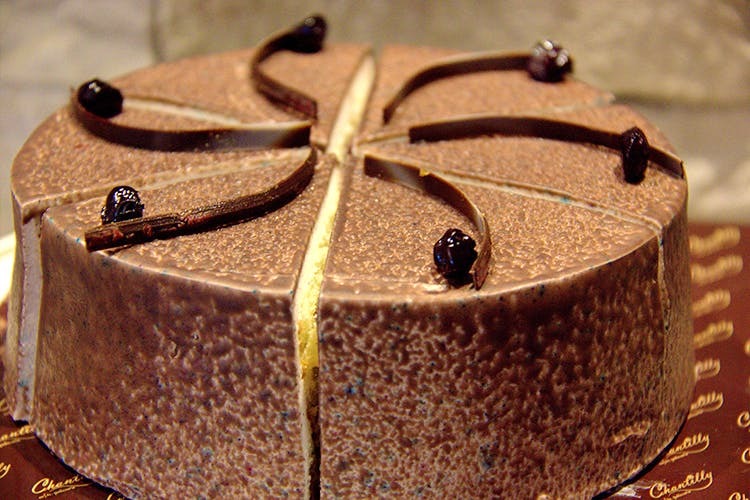 If you are looking for homely tea cakes or gourmet pastries and desserts, then you have arrived at the right address. Plus, they also do full cakes for rather reasonable prices. Chantilly is yet another instalment on the Indiranagar cake wagon and this picket-fenced sweet haven is on Indiranagar’s 12th Main Road. Recently set up, Chantilly caught our attention for its cosy setting and its decadent cakes. Started by two of Lavonne’s diplomates, this cafe is certified yum and aims to bring quality bakes and desserts to the table. We tried their Banana Walnut Bread which reminded us of mom-made cakes, and their gooey brownies that achieved the perfect balance of sweet and nutty. All the cream used in Chantilly’s cakes are made fresh at the cafe and we could taste the difference. We loved their Choco-Almond cake too, and their Choco-Oreo pastry which is a cheesecake-mousse hybrid that tastes as delicious as you’d expect. We hear that their Classic Opera Cake with layers of coffee buttercream and chocolate ganache makes for a classic sweet treat as well. Oh, and their Oreo Cookie Crumble is just heaven. Brownie, Oreo chunks, chocolate sauce, fudge and vanilla ice cream all get together for a marriage that will last forever! Chantilly is planning to keep things interesting by changing up their cakes and desserts on a weekly basis. And they serve some savoury bites like sandwiches too. We’re big fans of the Golden Shrooms sandwich, which has carmelised onions and mushrooms in it. The Creamed Chicken sandwich with herbs is another favourite, but second to the slow-cooked pork in barbecue sauce. And the prices just make everything sweeter. Ranging from INR 50 for their brownies and cupcakes, to INR 120 for a slice of their cakes and pastries, these sweet bites make for an affordable dessert. Sandwiches start at a reasonable INR 100 too. You can even purchase a whole cake. Their 500g cakes starting at INR 550 only and their 1kg cakes starting at INR 1,000. You can buy the cakes straight off their shelves or get them home delivered by ringing them up at +91 9845377075. And these guys do customised cakes as well. Wedding, birthdays, theme parties, they’ve got you covered.